A pleasure to own, a sound investment, the easiest way to acquire is by instalments, bank to bank, ask us for details, or using PayPal via the Purchase Page. 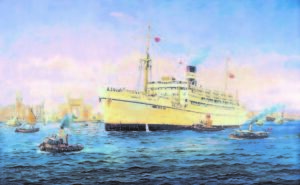 Marine art by Gordon Frickers 50 x 81 cm (20″ x 32″), Oils on canvas, commissioned, sold. London was frequently covered in Smog from all the coal burning. Pas: 60 1st, 180 2nd, 2441 deck. 1955 deck passengers replaced by 850 bunked. Finally 308 cabin. 1971 scrapped at Kaohsiung. 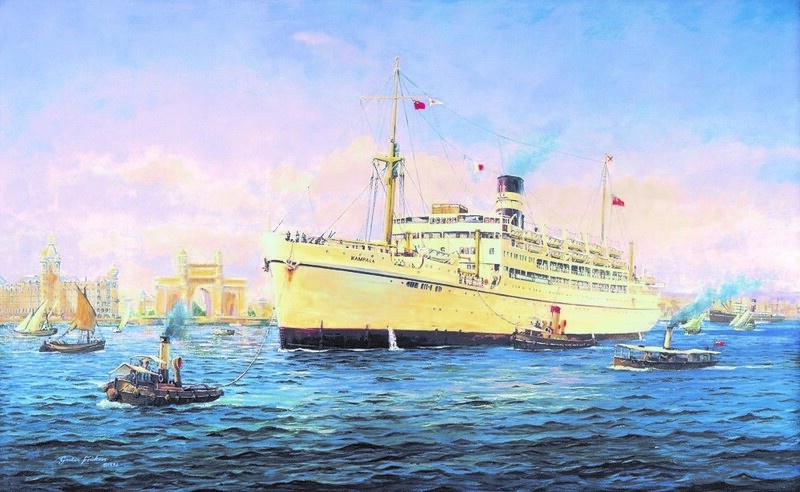 The British India Steam Navigation Company, once one of the largest shipping companies in the world, merged with P&O (Peninsular and Orient).